Sending and receiving holiday cards has been an American tradition for decades, and in the digital age, it was taken an exciting turn. Not only can businesses share holiday e-cards with their hundreds, and even thousand of customers, but the cards can also be customized, animated, and include audio! If your business already sends physical cards to customers, make the eco-friendly switch to virtual. If your business does not send any cards during the holiday season, you’re missing out on a marketing opportunity. So why exactly should a business owner invest in sending holiday e-cards? Great question! It’s simple, in the clutter of emails customers receive about deals, specials, and discounts around the holiday season, it is refreshing to open an email with substance. After opening email after email blurting out how much one would save if they’d shop with them, opening an email with a sincere title, delightful designs, animations, and a kind message would stand out from the others. The festive e-card would be regarded as a thoughtful gesture as opposed to just another email blast clogging up one’s inbox. Which email would make you feel like a valued individual, and which would make you feel like you are just getting sold to? This smart, but subtle marketing tactic not only illustrates your business to be friendly and welcoming, but also caring and personable. Holiday cards are traditionally used to to spread cheer and share warm wishes. A holiday card from a business dilutes the company/ customer divide and influences the customer to view the business more as a friend, a friend they feel they should remain loyal towards. 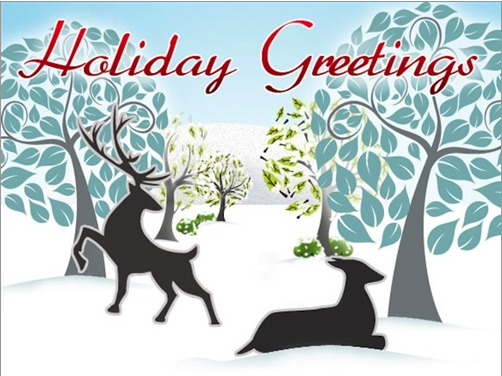 Sending holiday e-cards to customers also keeps a positive image of your business in their mind. It makes it more likely for those customers to go to you as oppose to your competition, who didn’t make the effort to send a holiday card. Now that you are aware of the benefits of holiday e-cards, you may be wondering where to get such cards. One way is to hire a graphic designer to create your e-card. However, you may not receive the same quality of service from a freelance designer as you would a professional service that specializes in e-cards. Professional e-card services often have a selection of pre-made e-card designs, as well as options to create custom cards. Some even offer the option of sending the e-cards to the addresses in your business’s mailing list. Sending holiday e-cards is a simple gesture, that increases exposure for your business, lightens anyone’s inbox, and impacts the customer on an emotional level. Take advantage of this marketing tactic that can only be utilized once a year.